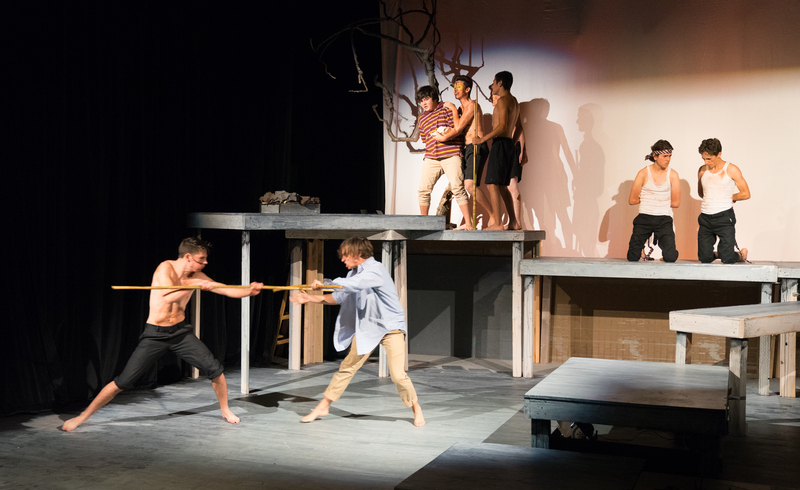 A Theatre Near U tackles the stage adaptation of William Golding’s classic novel, Lord of the Flies, a story touching on timeless themes showing just how tenuous a thing civilization can be. Golding’s novel was published in 1954, a time of high tension in various parts of the world. He’s quoted as saying that writing this story was “like lamenting the lost childhood of the world.” He knew of whence he wrote having lived through both world wars, served in the Royal Navy in WWII, and spent several years as a schoolmaster. As such, he was well-versed in the fortitude and foibles of humanity overall, and of schoolboys in particular. Golding’s iconic novel is likely well-known to many who’ve made their way through a Modern English Literature class in high school. Nigel Williams adapted Golding’s story for the stage and saw it first performed on his son’s school’s stage in Wimbledon in 1991. The play made its professional debut in 1995, and the script was widely published in 1996. Though the play is somewhat compressed, Williams keeps the tension of the original material intact. The story follows a group of schoolboys who are stranded on a tropical island without adult supervision after a plane crash. As might be expected in such a situation, socialization gives way to instinct rather quickly, and survival is not guaranteed. Humans are tribal by nature, which explains the need to constantly categorize everyone into a version of us and them. Instinct underlies all animal behavior, including humans, and only awareness and diligence can keep it at bay. In times of extreme stress or conflict, instinct can prove a worthy adversary, particularly if social niceties aren’t yet ingrained. 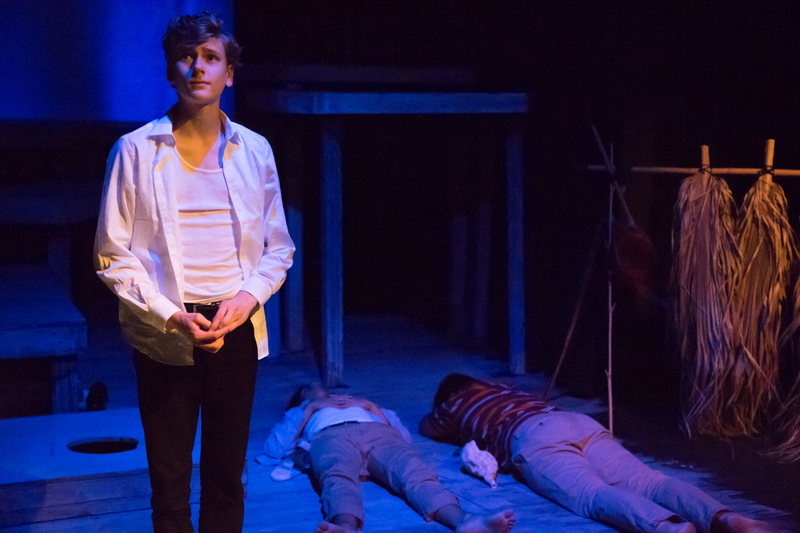 Directors Tanna Herr and Tony Kienitz have assembled a talented cast of ten boys to present this taut tale. In using only ten, they combine a few characters in the play, but all of the traits are still represented. Although the actors are slightly older than the boys in the story, they still relate well to the roles they assume. Each character has his own story arc, and collectively they represent facets of Golding’s personal experiences from the WWII era encompassing good, evil, survival, and the stereotype of what manhood means. 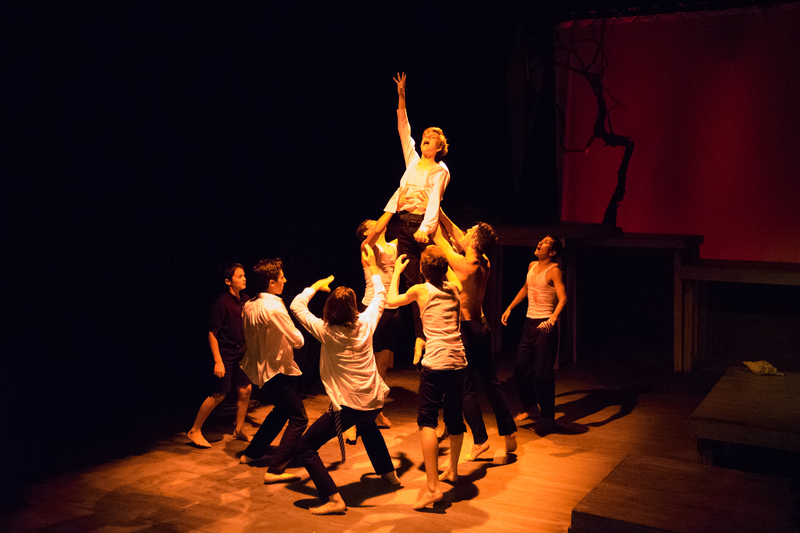 The novel, and the resulting stage adaptation were written by Englishmen telling this story about a group of English youth from a 1950s fictional atomic war era’s perspective. Herr and Kienitz have updated this production to a group of modern American schoolboys. They’ve slightly modified the script in places, but there are still some British and cold war references that remain. Kienitz also designed the set, which abstractly evokes the island and uses multiple levels to nicely space out the action. A split-level platform rests upstage with long landings leading up to it center-left. The upstage platform serves not only as the “mountain” but also allows action to take place underneath. This provides some separation, allowing an avenue for the boys to traipse through the woodland’s underbrush. The downstage area generally represents the beach, and a makeshift shelter is eventually erected down left. We imagine the ocean and the trees on the island based on the action and the dialog. Griffin Willard’s sound design includes rolling waves and seagulls throughout the piece, which greatly enhances the tropical illusion. Herr and Kienitz stage this one in such a way that the action is continuous. Hadley So’s lighting design is instrumental in helping make this happen. Freezes by the actors combined by well-timed light shifts adroitly direct focus to where it needs to be, at times very quickly alternating between two parallel sequences. Ralph (Jackson Wylder) is a natural leader. He tries to do what’s right, and he listens to those around him. He’s not the biggest, not necessarily the brightest or the fastest, and he is also not perfect, but he tries. Wylder has the most complex role in that Ralph has elements of almost every part of society within him. He plays him in a very believable way. He doesn’t overdo it, but he shows a wide range of emotions from Ralph’s initial confidence and optimism that they’ll be rescued, to abject terror and despair when things become deadly. His portrayals of Ralph’s brief slips in succumbing to the evolving madness and then recovering his humanity when his character realizes what he’s done are both realistic and poignant. Jack (Raymónd McCarthy) is all id in psychological terms. He is the choir prefect of his school, and he has an air of entitlement. He’s athletic and bigger than most of the other boys, he likes to win, and he is a hunter. He is immediately at odds with Ralph, who he sees as a rival to be quashed. McCarthy plays Jack with a sense of abandon, and his transformation from proper prefect to savage leader is rapid and palpable. Piggy (Antonio Rojas) is ever the outsider, but he seeks cooperation, reason, order, and above all, fairness. He is different, and he has some handicaps in body build and visual acuity. Rojas plays Piggy with sensitivity, though a few times, he seems a little disconnected from his lines speaking more like he’s reciting a prepared speech than emoting in a situation. Part of that might be the result of his lines having been originally written in dialect, and a few of those just don’t quite translate cleanly. Nonetheless, Rojas captures Piggy’s determination, and he makes him a very sympathetic character. Simon (Daniel Lindstrom) is different. He is a member of the choir, but the other boys taunt him because he has some serious handicaps. He also sees the world differently than most. Whether he’s more in touch with nature and the cosmos or just suffers from unbalanced brain chemistry is in the eye of the beholder. Lindstrom portrays a very amiable and gentle character. He dons an almost mystical presence during his heartfelt monologue providing the title’s symbolism before a traumatic event. Sam (Gil Weissman) and Eric (David Foster) are brothers in the choir who have an odd habit of speaking together as one, which Weissman and Foster do quite well. Maurice (Enzo Sapojnikoff) and Bill (Troy King) fill out the choir, both followers trying to fit in. Sapojnikoff is downright manic at times as the “class clown,” unpredictably switching allegiances. King plays an able soldier. Roger (Johannes de Quant) is an outsider, initially quiet and unassuming. He eventually takes a very active role in a surprisingly savage manner transforming into the consummate psychopath, and de Quant is absolutely frightening following this transformation. Percival (Noah Crawford) is the “lit’lun” and just tries to fit in. He is an innocent, but in order to survive, he is easily corrupted. Crawford is a little stiff at first, but he portrays a nice vulnerability in a couple of key places. The action is very physical. From the start, the boys scamper up and down the platforms with ease. Cara Kienitz adds some complicated choreography in places as well, including several fights, primitive dances, and a semi-military entrance, all of which are executed expertly. All of the fights have a fluidity reminiscent of martial arts forms, and they are very well-rehearsed. The precision and speed of execution adds great realism to those sequences. The extended primitive dance sequence surrounding a pivotal event in the story is quite stylized with leaps and sharp rhythmic routines that are well-synchronized and very powerful. McCarthy in particular executes both the dance moves and fight sequences with exceptional agility. Even many of his freeze-poses strike an aristocratic air. This is a tense, timely, and engrossing production. The themes are hard-hitting, and there is violence in the action. There is a good deal of shouting along the way as well, particularly during the conflicts, but this fits the story. This type of scenario plays out in miniature on school yards every day, but not to the extreme seen on this island. These young actors give this show everything they’ve got, and that comes through in their performances. The story is relevant if for nothing else than to make us appreciate the value of civilization. And for the perspicacious audience member, they might notice some interesting connections to current world events. See: A Theatre Near U for more information. ← FMT lets its Freak Flag fly!